Finished playing Beyond 2 Souls yesterday. I did get it on release day the long time to beat it was not from gameplay. I just took my time beating it. Graphically & Voice acting are top notch. Voice of main character is Ellen Page and supporting voice actor Willem Defoe. The characters also look like them as well. From what I understand they were also motion captured. If you have played any of Quantic Dream’s games then you should have a idea that games they make are story driven. Either you like these type games or you don’t that seems to always be the case with any of Quantic releases. While individuals have different opinions game reviewers all rate it highly. I personally liked the gameplay and story. Personally prefer story driven games so my thoughts on this game shouldn’t be considered unbiased. If your not a gamer and like movies then Quantic Dream games are probably for you. Other games they made that are also excellent in story are Farenheit-UK name /version PC, Indigo Prophecy is Farenheit but is USA release also PC. Then Heavy Rain which was a PC release but was later made for PlayStation 3 only. All 3 of these games are excellent in my opinion. Indigo Prophecy can be purchased for PC digitally online check the normal places. It can also be purchased for the PlayStation 2 & Original Xbox for $9.99 at Gamestop. Heavy Rain PlayStation 3 only Gamestop Used:$17.99 Directors cut Used $18.99. New $29.99 New for Directors Cut $19.99. Better off going with directors cut. The Director’s Cut includes the original game, Heavy Rain Chronicles: Episode 1 – The Taxidermist DLC, a series of 8 “Making of” bonus videos, the game’s soundtrack, three dynamic themes and more. Beyond 2 Souls PlayStation 3 only new $59.99 used $54.99. I got Assassin’s Creed IV a few days after release date didn’t bother with it because I really didn’t enjoy any game after the original. While I did play it through the opening of the game I never got past the docks. Then a new patch was issued which included Nvidias PhysX it was not originally included in the release build. Dropped the patch on cranked the PhysX option to Maximum because Nvidia claims any GTX line 600 series and up can do so. This wasn’t the case even with PhysX set on low the game studdered terribly. I installed the latest driver for my Geforce GTX 680 Superclocked edition GPU. So it was up to date!…yes & no. After a few days of trying different options and graphics settings I couldn’t get a happy medium performance. So today 01/18/2014 I look at PhysX driver version it wasn’t the latest driver build. So I went and downloaded PhysX_9.13.0927_SystemSoftware and sure enough it fixed the issue everything cranked to top and running buttery smooth. Through all the testing with old PhysX drivers I had managed to get a bit further in game. Only to be at a part escaping and stealing a boat. As soon as rouge waves started pounding the ship I was hooked. Now I must play & finish the game through. Here are the PhysX drivers I installed and fixed studdering issue with. Use the Playstation 4 controller on your computer. The Playstation 4 controller can be used on your computer. Some games are just meant to be played with a controller. I’ve been playing Metal Gear Rising Revengence and playing with the PS4 controller just feels better. You can either use it wirelessly-Bluetooth or use the USB cord that comes with the PS4 controller and plug into USB port. Once you plug the controller in it will find the controller in Windows 8/8.1 but games will not. I have not tried this on Win Vista or Win7. The fix for that is DS4 it is an application that I found on the PCSX2 forums. A member screen name InhexSTER was the one who made this tool. I have scanned the app with latest Avast Anti-Virus and is clean still make sure to scan yourself. Make sure to read the readme that is included in the zip file before using. It will explain how to use DS4 tool. As of now it only supports basic functions and rumble. I’m sure they are working on implementing the touch pad. Obtained this Television from a friend who got it from a customer that was throwing it away because it no longer powered on. If it did turn on it would just turn off & on repeatedly not getting a picture at all. After testing in different temperature environments I was able to get it to power on finally but the next day temp changed in the house and it would no longer power back on. 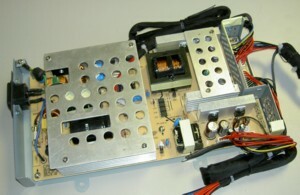 The main things to go over in power issues is taking the LCD ore Plasma TV apart and checking the Capacitors. Caps bulge and can leak when this happens this is most likely the cause of it to no longer power on or flicker. The power board isn’t very large. First thing to do is take the stand off bottom very simple only a few long screws. Should get help when removing this. Best way I found to remove the stand is to leave it standing up unscrew the bolts and have some one help lift the TV off the stand. You have to have the stand loose all screws removed in order to remove the Speakers that are attached to bottom base of TV. Once the Stand is loose it’s time to go ahead and unplug speaker wires and remove speakers from the TV. It’s only like 2-4 screws to remove the speakers. Save screws that are for speakers put in bag and tape to speakers. Move stand away save the screws in a bag and tape to the stand. Place TV face down on a clean counter top. Make sure there is nothing on the surface a screw or hard item will crack the screen if you do that may as well toss it at that point. Repairing a screen isn’t worth it. With the Television face down its time to pull all the screws that are holding the frame of TV together. There will be quite a few make sure you save all of them. Once all are removed you will need a hard thin flat plastic pry tool or thin knife to unlock the back. Start at top right or left of the TV once you pop the first one just gently slide knife along the crease until the next lock and give the knife a push & slight pry upwards that will pop the lock every time do this around the whole frame until you take the back off. Take your time don’t just pull it open make sure no wire harnesses are taped or attached to the back plate of TV. Now the back panel of the LEDTV is off and mainboard is exposed. You will be removing the Powerboard. You will be removing the 4 screws that are on each corner of the larger aluminum-plate. Also go ahead and remove the small plate as well 2-screws on that plate. I went ahead and circled the 6-screws in total. Now that the Powerboard is out and the 2 plates are removed. Make sure to save the 6 screws you removed you will want to be putting the plates back on after repair is complete. If you have a magnifying glass handy it will help. 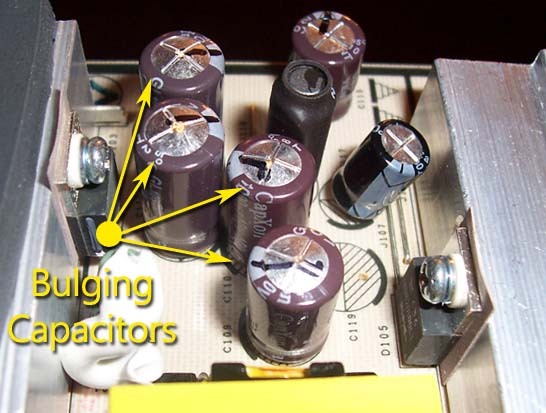 You will want to inspect the capacitors for buldging or leakage. 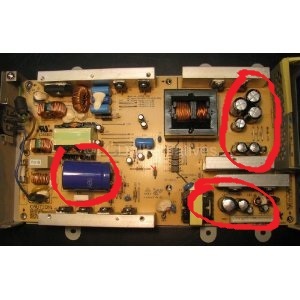 Circled is the capacitors you will want to look over. Total of 10 capacitors to go over. All are circled in RED. 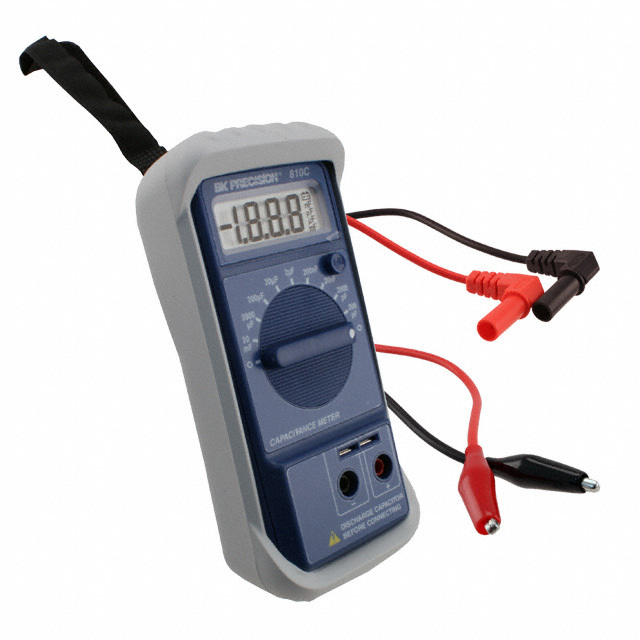 You can also purchase a Ohm/capacitor tester. They cost anywhere from $50 & up. If you don’t have one then you can look at capacitors by eye leakage or bulging capacitors are bad. You can replace just the bad ones you see or you can just go ahead and replace every cap on the board 10-total. If your not sure what a bad capacitor looks like these pictures will give you a good idea. 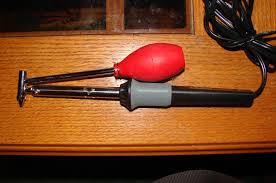 To remove capacitors you’ll need a Desoldering tool. I purchased mine quite a few years back at Radio Shack for $14.99. It’s cheap but works perfect for cap removal. 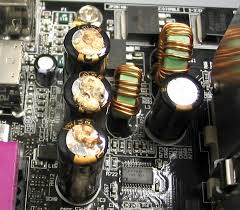 DO NOT REMOVE ALL THE CAPACITORS AT 1-TIME! First you will look and see uF and Voltage they are “This is when a magnifying glass will come in handy”. They will not all be the same. It’s important to always get the right Voltage and uF. Radio shack will not have capacitors of these values. You must buy from a parts repair shop or online. have paper and pen handy to write down the values to bring with you when you are buying locally. Once you have the right capacitors in hand at home. It’s now time to remove the caps. Remove 1 capacitor at a time and replace. The capacitors have a plus and minus> Positive will have the longer leg. When in the board they are both cut so you must look at the cap before pulling it to identify the negative it will be on the side of capacitor. The board will also most likely label the positive or negative hole. It’s very important you do not reverse them. Just observe the caps when in the board you should be able to find on the cap and board where the positive and negative are. Weather you decided to replace just the bad ones or all of them. It’s time to put the board back in and connect the wires to the power board. Once you confirmed TV is repaired unplug from outlet and put the back on listen for the clicks that means the locks snapped in place. Go ahead and put all the screws back in. Put speakers & stand back on. If you mount is to wall then just put speakers on and mount. 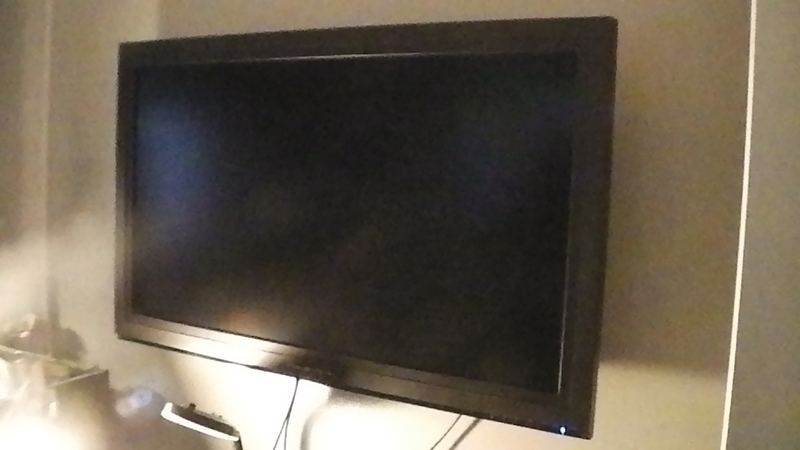 Here is the Olevia 42″ 242-T11 working after repairing. 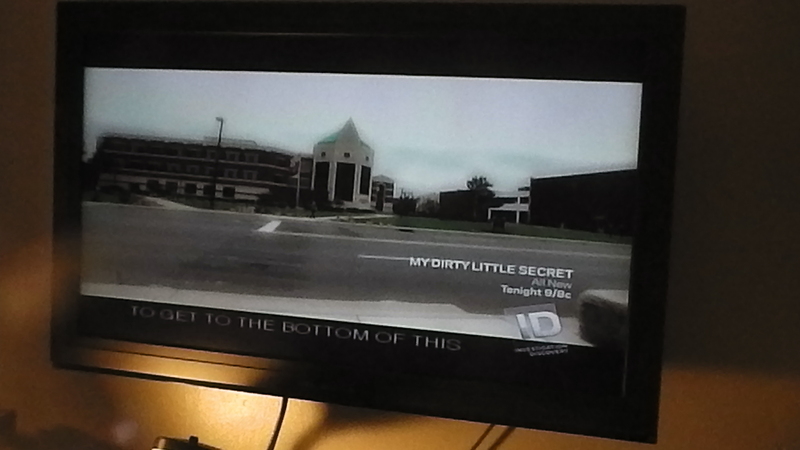 Hope this helps anyone out there who has this issue & Make /Model HDTV. This kind of issue happens with all kinds of electronics. Keep your eye out. Only issue still at hand is sound. Unfortunately the sound board is bad so have to use either a HT-Receiver or a sound bar for sound. Watching the Christmas Tree burn really showed how quickly it would burn a home down.